Sandy’s Coin Wash wants to make sure you have a great experience while doing laundry. 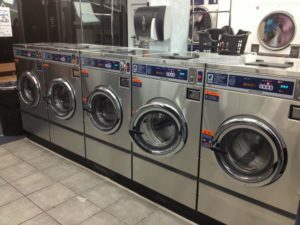 Our spacious facility is filled with tons of washing machines guaranteed to be clean and working and an enormous selection of dryers in a variety of sizes. Wondering if we have the right equipment to handle your washing and drying needs? Take a look below at the machines and equipment available and prepare to be amazed. We have so many machines available to help you get your laundry done quickly. You can use separate small machines for whites, lights and darks, and use our giant machines for comforters, sleeping bags, pillows and all your larger items. Not sure what kind of machine you need for washing or drying? Our Laundromat is staffed full-time by dedicated customer service representatives. These friendly and knowledgeable members of the Sandy’s Coin Wash family are on hand to help you decide which machines to use and instruct you on how to use them if you need help. Have a question? Machine not working right? Just let us know, and we’ll do everything we can to assist you.